The Korea Peninsula or Korean Peninsula is a peninsula in East Asia that extends southwards for about 684 miles or 1,100 kilometers from the continental Asia into the Pacific Ocean. The East Sea/Sea of Japan surrounds the peninsula on the east, the East China Sea to the south, the Yellow Sea to the west while the Korea Strait connects the first two bodies of water. Until the end of World War II, Korea comprised a single political entity whose territory roughly coincided with the Korean Peninsula. Since the cessation of the Korean War in 1953, the northern half has been occupied by North Korea, while the southern half has been occupied by South Korea. 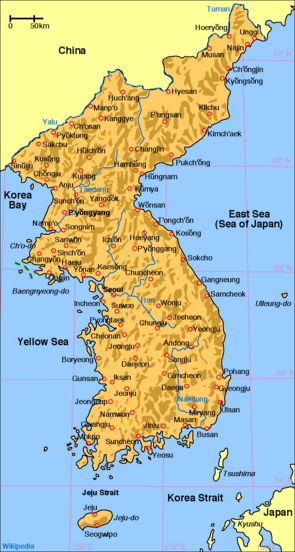 "Korean (or Korea) Peninsula," or "Korea," sometimes refers to these two states together, though in South Korea the word "Korea" refers specifically to the South. The northern boundaries for the Korean Peninsula coincide with today's political borders between North Korea and her northern neighbors, China (1,416 km) and Russia (19 km). The rivers Yalu/Amnok and Tumen/Tuman/Duman naturally form those borders. Taking that definition, the Korean Peninsula has an area of approximately 220,000 km². The peninsula has two names: Chosun Bando (조선반도) in North Korea and Han Bando (Hangul: 한반도) in South Korea due to the different names for Korea. Mountains cover seventy percent of the Korean Peninsula, with small, arable plains widely scattered far in between the successive mountain ranges. 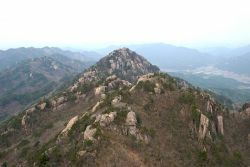 The peninsula becomes more mountainous towards the north and the east, with the highest mountains (including Baekdu Mountain which stands at 2,744 m) found in the north. The south and west coasts of the peninsula, highly irregular, extend 8,460 kilometers. Most of the 3,579 islands lay off the peninsula along the south and the west coasts. 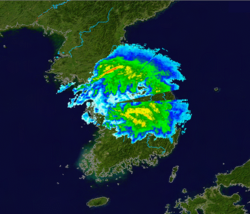 Severe Tropical Storm Ewiniar, South Korea. The climate of the Korean Peninsula differs dramatically from north to south. The southern regions experience a relatively warm and wet climate similar to that of Japan, affected by warm ocean waters including the East Korea Warm Current. The northern regions experience a colder and to some extent more inland climate, in common with Manchuria. For example, the Yalu River valley (600 mm) receives less than half the annual precipitation of the south coast (1500 mm). Likewise, the peninsula's southern and northern tips experience a 20 °C difference in January temperature. Still, similar general patterns affect the entire peninsula including the East Asian monsoon in midsummer and the frequent incidence of typhoons in autumn. The majority of rainfall takes place during the summer months, with nearly half during the monsoon alone. Winters are cold, with January temperatures typically below freezing outside of Jeju Island. Winter precipitation is minimal, with little snow accumulation outside of mountainous areas. Surveys of Korean flora have identified more than 3,000 species on the peninsula, of which more than 500 are endemic. The peninsula's floristic provinces are commonly divided between warm-temperate, temperate, and cold-temperate zones. The warm-temperate zone prevails over the southern coast and islands, including Jeju. It is typified by a large number of broad-leaved evergreens. The temperate zone covers the great majority of the peninsula, away from the southern coast and high mountains. 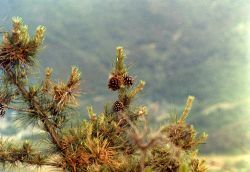 It is dominated by the Korean pine and various broad-leaved deciduous trees. Cold-temperate vegetation is found along the peninsula's northern fringe and in the high mountains, including the upper reaches of Hallasan on Jeju. Evergreens in this area include larch and juniper. Much of this vegetation is shared with Manchuria. Gwaneum Peak at Songnisan in South Korea. The terrain of the Korean Peninsula is rumpled, covered with low mountains. Most rocks are of Precambrian origin, although isolated pockets of Paleozoic, Mesozoic, and Cenozoic rock can also be found. There are no active volcanoes on the peninsula. However, Baekdu Mountain in the north and Hallasan in the south have crater lakes, indicating that they were active not long ago. In addition, Ulleungdo and Dokdo in the Sea of Japan (East Sea) is believed to have been of volcanic origin. Furthermore, hot springs indicative of low-level volcanic activity are widespread throughout the peninsula. Roughly two earthquakes are recorded per year, but few have any major impact. This page was last modified on 24 April 2018, at 14:28.